“I’m sitting in the middle,” she says, “because I don’t want you to kill each other.” They are quiet for a minute. Then, as she leans forward, they make ugly faces at each other behind her back. She sits back to enjoy the ride, never thinking to ask where the driver, her son-in-law, is heading. In about an hour, he parks the car in front of a Cape Cod-style house with a sign on it reading: Model Home. The boy runs to open the door. As the nonna and the family enter the living room, they see other visitors–all couples around the age of her daughter, all with children, racing around, grumbling, or just smiling. Her son-in-law leads the way. They walk through the kitchen, with its shiny big window and gleaming appliances. They enter the master bedroom, with windows set high enough to guarantee privacy. The children start to quibble as they approach a small corner bedroom. “This is the room I want,” the boy says. “No, I want this one for myself,” the girl says. They end the tour in the living room, with its small bay window. It is beginning to dawn on the nonna that this is no simple Sunday excursion. Her apprehension is confirmed when her son-in-law approaches a man sitting at a desk in the living room. The man hands him a brochure and begins reciting a set speech about how safe the streets here are for children, how wonderful it is that the house comes equipped with new appliances, and how a sprinkle of grass seed is going to produce a magnificent lawn. The nonna wonders if her daughter is planning on moving into a house like this with its clay lawn and shingle siding on a flat, flat street. She wonders if she is ever going to have a chance to walk the grandchildren to school again. And if her daughter is never going to call for her so they can walk to the novena together on Wednesday nights. When they return to the car, the nonna is twisting her handkerchief in her hands. She listens closely as her daughter points out all the advantages of living in Levittown. Her son-in-law? Not so much. He complains about the distance of the commute to his job, the fact that most of their furniture won’t fit in the “dinky” rooms, and what they are going to do for babysitting when they move away from the nonna. The nonna, fingers crossed beneath the knotted handkerchief, begins to relax. So maybe they won’t buy a house and move now. But she stops a tear from falling as she realizes it is only a matter of time — not only for her daughter and her family, but also for all the daughters on the block. Mix flour, salt, and sugar together. Cut butter into flour mixture until mixture resembles coarse corn meal. Work egg yolks into mixture, forming a soft, smooth dough. Wrap dough in plastic wrap; refrigerate at least 1 hour. Roll out dough to 1/4-inch thickness; cut in two, one piece larger than the other. Fit larger portion into 9-inch tart pan with a removable bottom. Slice remaining dough into 1-inch strips to use for lattice to top tart. 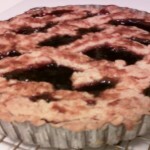 Spread jam over crust in pie pan; place strips of lattice on top. Blend egg yolk with milk; brush lattice to glaze. Place pie on rimmed cookie sheet or jelly roll pan to prevent spills. Bake in lower third of oven 1 hour, or until jam is bubbling and crust is golden. Place leftover lattice slices on cookie sheet around tart pan. Brush slices with glaze; sprinkle lightly with sugar. Bake 35 minutes, or until golden. Remove to wire rack to cool while tart contunues baking. This is moving towards “The Hidden Injuries of Class” turf…eventually they move & everything is different, right?